I was in the ancient city of Caesarea on the tail end of an 11-day family trip to Israel. Our guide Vivi led us over to a ledge overlooking a fenced-off excavation site on the Mediterranean Sea. 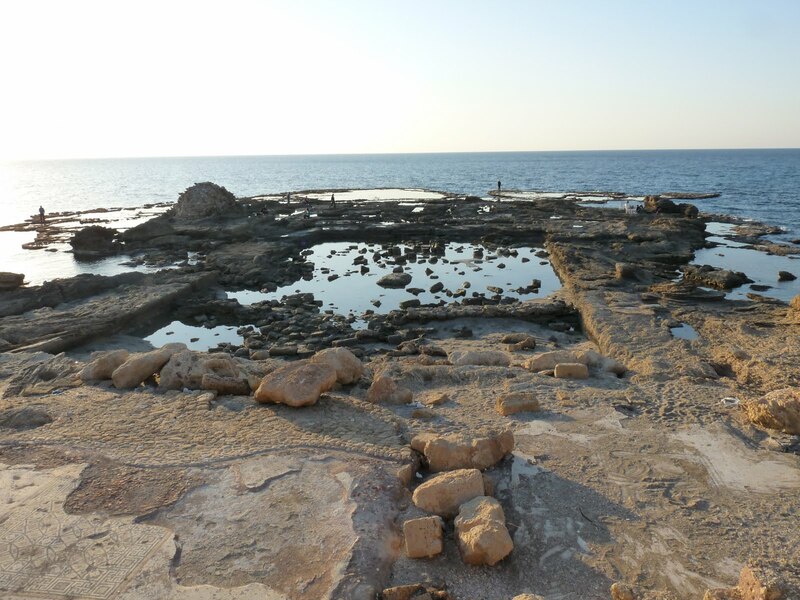 If we stood in this very spot about… 2000 years ago, we would be overlooking the patio of King Herod’s prime real estate beachfront palace, watching him sunbathe by his freshwater pool. Umbrella drink in hand. Vivi directed our gaze to the remains of a mosaic-tiled floor (see lower left corner on the above photo) that King Herod himself walked upon, perhaps after finishing his water aerobics class. These remains, hidden from the world for centuries, were such a new discovery that this was the first time our seasoned tour guide had seen them. Archeological eurekas like this are happening all over Israel – in Akko, in Beit Shean, in the Old City in Jerusalem. Israeli archeologists are not just interested in uncovering Israel’s Hebrew and Jewish past, but the history of every empire that conquered and then crumbled here through the ages. Greek, Roman, Ottoman, Crusader. No matter the era, Israel makes sure to preserve the artifacts of every past civilization that stood on her soil. At the same time, Israel struggles to make sure that its flag and its people will be conquered no more. Archeological discoveries, medical advances in cancer and heart disease research, the boom of Israeli high-tech startup companies — this is what is possible in an Israel with defensible borders. I’ve been home in Rochester for six weeks. Last night, I listened with about 200 others to a presentation about the news in the Middle East given by Israeli professor, think tank advisor, and political commentator Dr. Reuven Hazan sponsored by the Jewish Federation of Greater Rochester. Considering the ever changing situation in this part of the world, we wondered where he could possibly start. Consider the week’s Middle East headlines. Iran’s supreme leader Ayatollah Ali Khamenei endorsed a new doctrine explaining why it would be ‘legally and morally justified’ to commit genocide and wipe Israel off the map. Within all this turmoil, Dr. Hazan tried to focus on the positive, internal news of Israel. Within the chaotic Arab Spring, surrounded by 21 Arab Nations, Israel is the calm eye of the storm. The current Israeli government has been stable since 2009. Israelis, who once held security and preventing terrorist attacks as their top priority, are now acting more like their American counterparts in the Occupy Wall Street movement. They want fair housing prices and an even distribution of wealth, just like the 99 percent here do. Never before in the history of Israel have the hawks of the Likud party and the doves of the Labor party danced so closely together. They understand that in the 21st Century, land that was always held in regard as a buffer zone for national security against wars fought with soldiers and tanks can no longer keep Israel safe in wars fought with long range SCUD or nuclear missiles. But still, the need for defensible borders will always remain. Israel is a skinny country. In a weight obsessed world, Israel can’t afford to lose its girth. To illustrate just how skinny Israel is at its narrowest pre-1967 borders, Hazan explained just how skinny Israel’s narrowest point (9.3 mi) really is: If you poured yourself a cup of coffee for work by the coast and your commute was at the other side of this 9-mile drive, your coffee would still be piping hot. So, within these borders, Israel watches the developments of its neighbors embroiled in its Arab Spring, and she is very scared. The border between Egypt and Israel is once again active. Money that could be spent on social issues is instead being used to bolster security. A gas pipeline supplying Israel with fuel from Egypt, as part of the Israel/Egypt peace agreement, has been blown up and disrupted no more than five times in the last six months, evidence that the rioters of the new Egypt want no ties with Israel. Jordan, another bordering country that has received life giving water and agricultural technology from Israel as a result of peace agreements, cannot control the throngs of people in the streets that recently greeted and cheered a visiting leader of Hamas. Finally, when questioned about Iran, Dr. Hazan sternly warned us that time with Iran is running out. An attack on Iran to stop a nuclear genocide would be most successful if Israel could depend on the US for military action. But if necessary, Israel will go it alone. Will the world condemn Israel if it strikes Iran? Sure. But, Israel would rather be condemned and stay in existence than be wiped out and be the world’s darling. As I listened to those words, I thought back to that moment of overlooking King Herod’s pool. In the face of extinction, Israel is continually digging up its ancient past and busy building its high-tech present, all the while threatened by Iran for its existential future. No matter what sacrifices it makes for peace, no matter how much land it gives back, its sunny coastline with its mosaic tiled floor may very well be the Jewish state’s only peaceful border.